SPRINGFIELD, IL – The state of Illinois will no longer restrict the movement of any cut, non-coniferous firewood within the state. Illinois joins Missouri, Iowa, and Kentucky in the deregulation of Emerald Ash Borer (EAB). The 2015 survey of traps detected EAB in 10 new counties in Illinois: Madison, Mercer, Jackson, Saline, Hamilton, Wayne, Clay, Jefferson, Washington and Bond. The addition of 10 new counties has brought the total count of confirmed counties to 60. Previously EAB presence was confirmed in 50 counties, but 61 of Illinois’ 102 counties were under a state quarantine, which was intended to prevent artificial or human assisted spread of the beetle. Since the first detection of the pest near Detroit, Michigan, in 2002, the beetle has killed more than 250 million ash trees. The borer, known for its distinctive, metallic green wing color, is native to Asia. Its larvae burrow into the bark of ash trees, causing the trees to starve and eventually die. The tiny beetle often is difficult to detect, especially in newly-infested trees. Signs of infestation include thinning and yellowing of leaves, D-shaped holes in the bark of the trunk or branches and basal shoots. Each year Illinois Department of Agriculture officials submit samples from various purple EAB traps throughout the state and send them to the USDA’s Animal and Plant Health Inspection Service (APHIS) to confirm the presence of EAB. 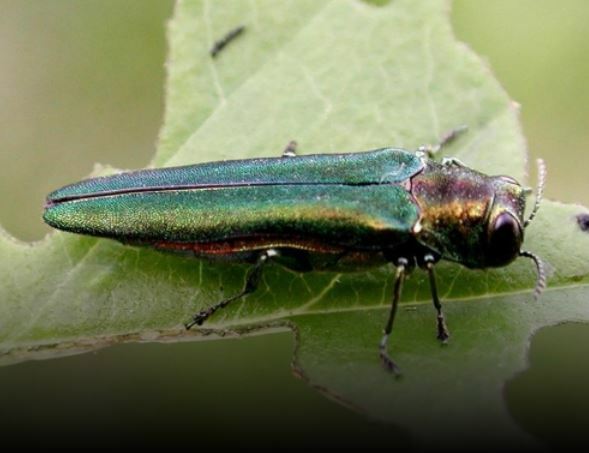 Anyone who suspects an ash tree has been infested should contact their county Extension office, their village forester or the Illinois Department of Agriculture at (815) 787-5476.